To make sure your LimeSDR hardware is working as it should, you should carry out loopback, reception, and transmission tests before beginning to use the hardware in your project. While hardware problems are rare, they can happen - and finding out after a few minutes of testing is better than finding out hours, days, or weeks into a project build. Please note that these tests require Lime Suite to be installed and configured on your host PC. If you have not yet done so, follow the instructions on Getting Started with Lime Suite. The procedure for testing your hardware will vary depending on which model of LimeSDR you are using. The LimeSDR Mini comes with a dedicated testing utility, dubbed LimeQuickTest, as part of the Lime Suite software bundle. LimeQuickTest carries out a number of checks on the hardware, including the clock network, the FPGA, the LMS7002M programmable radio IC, and radiofrequency loopback testing, in a matter of seconds, giving you a quick pass or fail result. LimeQuickTest is currently available for both Linux and Windows operating systems; it is not yet available for Apple's macOS operating system. Users with macOS are advised to test their LimeSDR Mini on a Linux or Windows machine, or using a virtual machine on top of their existing macOS operating system, until a native test tool is made available. LimeQuickTest is bundled with the Lime Suite software package as standard, and does not require separate installation. If you are using an older version of Lime Suite, it may not include LimeQuickTest; in this case, simply update Lime Suite by downloading the latest Windows binary release, updating from the Linux PPA archive, or by downloading and compiling the latest source code from the Lime Suite GitHub repository. The test will begin immediately, and take around 15-20 seconds to complete. Each test category will be summarised and a pass or fail grade reported, along with an overall pass or fail. In the event that any of the categories present a failure status, please contact support with a copy of the full test output for further information. Click on "Start Test" to begin the testing process. This mode runs the same tests as the non-GUI mode, but presents the pass and fail information in a visual format as well as a full log. A green light indicates a test category has passed; a red light indicates a failure. The LimeSDR USB and PCIe include a more detailed loopback test function, which must be executed using the LimeSuiteGUI application. The following steps will guide you through downloading the test files, configuring the LimeSDR USB or LimeSDR PCIe for loopback testing, and carrying out the test. Note that, at present, the LimeQuickTest utility does not support the LimeSDR USB or LimeSDR PCIe. The two INI files, which contain initialisation instructions for Lime Suite GUI, can be left as they are once downloaded; the waveform files, contained in an archive, should be extracted into the folder "lms7suite_wfm". 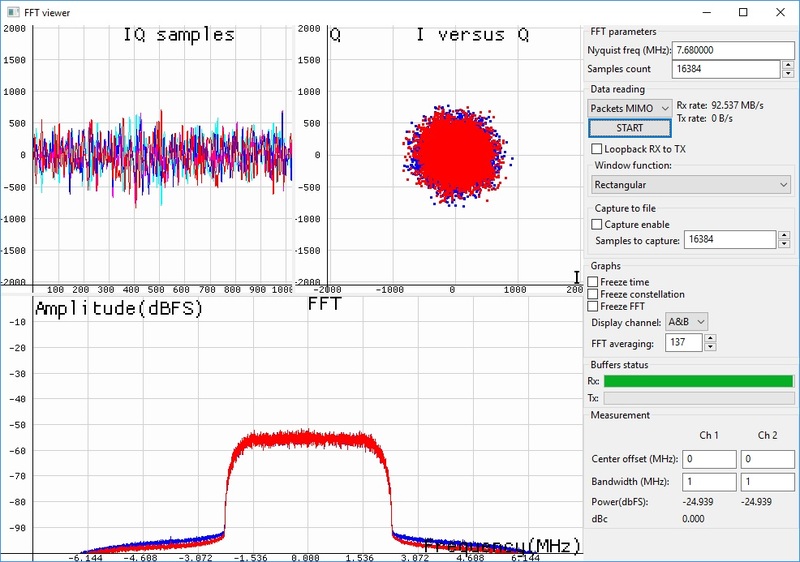 The simplest test for a LimeSDR is the loopback test, which links the device's transmission channel to its receive channel and transmits a test signal for display using Lime Suite GUI's Fast Fourier Transform (FFT) viewer. It requires no hardware beyond a PC with Lime Suite installed and the LimeSDR itself, not even an antenna. at a command line interface or "run" prompt. When it has loaded, click the "Options" menu followed by "Connection Settings." 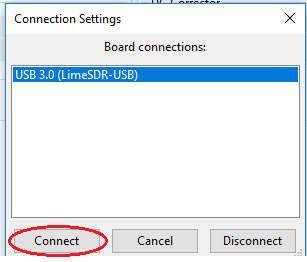 If you have more than one LimeSDR device connected, choose the one you wish to test from the "Board Connections" list, then click "Connect." 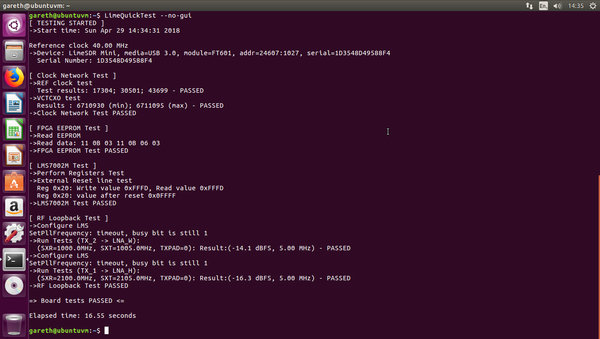 then browse to the directory where you downloaded the files and click on "self_test.ini" followed by the "Open" button. This will load the configuration settings from the file into Lime Suite GUI, ready for the test. These settings now need to be programmed into the LimeSDR itself. Click on the "GUI->Chip" button to load the settings from Lime Suite GUI into the LimeSDR and prepare it for the loopback test. Note that if you had previously loaded other settings into the LimeSDR, these will be overwritten by the self-test settings. Two settings need to be adjusted to ensure accurate results from the loopback test. Start by clicking the "SXT" tab followed by the "Calculate" button and then the "Tune" button to set the LimeSDR to use the calculated value. Next, click the "SXT" tab followed by the "Calculate" button and then the "Tune" button. Again, this will load the calculated value into the LimeSDR. In order for the LimeSDR to receive its own signal, it must be set into loopback mode. Click on the "Modules" menu item, followed by "Board Controls." If using a LimeSDR Mini, tick the "RF Loopback ch.A" box only; if using any other model of LimeSDR, tick both the "RF loopback ch.A" and "RF loopback ch.B" boxes. To carry out the loopback test, the LimeSDR needs a signal to send. 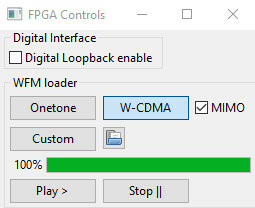 To load a sample W-CDMA waveform, click the "Modules" menu followed by "FPGA Controls." Tick the box marked "MIMO", then click the "W-CDMA" button to load the sample waveform. Click on the "Modules" menu, then click on "FFTviewer." In the window that appears, click on the drop-down box under "Data Reading" at the right-hand side and click on "LMS MIMO" (formerly "Packets MIMO") in the drop-down list that appears. If using a LimeSDR Mini, choose "A" from the "Display Channel" drop-down in the "Graphs" section; if using any other model of LimeSDR, choose "A&B". Click the "Start" button to begin receiving and displaying samples from the W-CDMA waveform via the loopback channel you have set up. If using the LimeSDR Mini, only one channel will be graphed; if using any other model of LimeSDR, two channels will be graphed in different colours. The channels will show an obvious curve, as pictured. If no curve appears, if only one channel is showing a strong curve, or if there is obvious noise displayed in the graph, this may indicate a hardware problem. Begin by updating your Lime Suite, firmware, and gateware versions as described in Getting Started with Lime Suite and LimeSDR Firmware Management, then attempt the loopback test again. If possible, try the test on a second computer to rule out interference from other software or hardware. If the problem still remains, please contact Crowd Supply for information on any further testing that may be required before a replacement can be arranged. Testing of the receive and transmit paths on the LimeSDR can also be carried out without using the loopback channel, as described in LimeSDR-USB Quick Test. Note that these tests require additional hardware: an antenna for the receive test and a spectrum analyser for the transmit test. If you are in the process of setting up your LimeSDR, the successful completion of this test means you can now start building practical projects around it. For inspiration, and for more details on the LimeSDR and how it works, take a look at Karl Woodward's LimeSDR Made Simple series on the Myriad-RF blog.